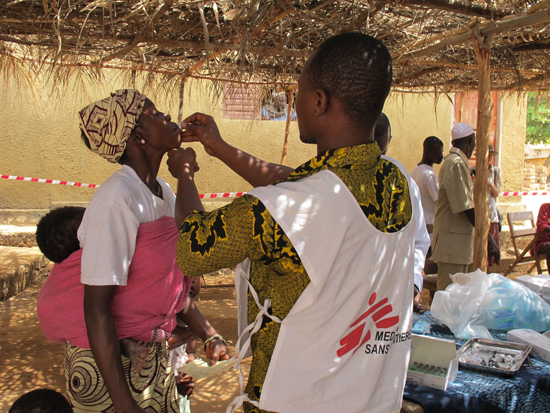 After a cholera epidemic broke out in Guinea, MSF began a mass vaccination campaign, the first time the organization has done so in Africa. After a cholera epidemic broke out in Guinea, Doctors Without Borders/Médecins Sans Frontières (MSF) began a mass vaccination campaign, the first time the organization has done so in Africa. At present, teams are vaccinating more than 150,000 people in the Boffa region, near the capital of Conakry, using an oral vaccine designed to protect those who take it from contracting the disease. The first two phases of this campaign began on April 18. "The epidemic in Guinea was declared in February and Boffa Prefecture is currently where we are seeing the largest active outbreak," said Charles Gaudry, head of mission for MSF in Guinea. "Since the beginning of the epidemic, 152 cases of cholera and six deaths have been reported. We aim to vaccinate around 155,000 people." Traditionally, the fight against cholera has involved treating patients, promoting hygiene activities, and providing access to drinking water. Although these measures are crucial, they do not necessarily limit the spread of the disease. The use of an oral vaccine during an epidemic represents a real opportunity to limit the transmission. "The use of this vaccine in the case of an outbreak has been validated by the World Health Organization," notes Gaudry. "Two doses of the oral vaccine are administered two to six weeks apart. It is very important that both rounds of immunization occur in order to ensure optimal protection." MSF has been involved in the management of cholera epidemics in countries such as in Haiti, Angola, and Zimbabwe. In addition to treating patients and spreading the word within the community about the disease, the use of this vaccine will prevent a large number of cases and deaths. "Together with the Ministry of Health, we have established more than 30 teams, and each was vaccinating more than 1,000 people per day during five days," Gaudry says. "We are beginning the second phase in about 15 days. Given this is the first time we have carried out such a campaign, we will also be documenting its feasibility, the vaccination coverage and how it is accepted by the population. This will enable us to improve our vaccination strategies during any future epidemic."